Unforgettable Big Band has performed for numerous organizations and private events in addition to our own. The band is available for most types of receptions, dances, and corporate or special events. 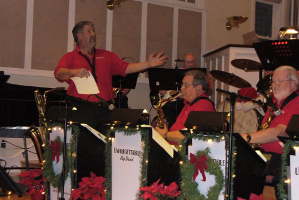 In addition, the band accepts sponsorship contributions for special performances and concerts such as our Big Band Christmas series and our Sinatra Centennial series. We are familiar with most of the area's major venues, and flexible and easy to work with in planning and scheduling. You may contact us by using the link in the menu of this website, or by emailing unforgettablebigband@gmail.com at any time to make your event Unforgettable. Some of our past clients have included.